Solid-State-Drives are getting more and more common in ESXi Hosts. They are used for caching (vFlash Read Cache, PernixData FVP), Virtual SAN or plain Datastores. A problem that comes with SSDs is their limited lifetime per cell. Depending on their technology, each cell can be overwritten from 1.000 times in consumer TLC SSDs up to 100.000 times in enterprise SLC based SSDs. The value to keep an eye on is the guaranteed TBW (Total Bytes Written or Terabytes Written) which is typically provided by the vendor in their specifications. This value describes how many Terabytes can be written to the entire device, until the warranty expires. The current value can be readout with S.M.A.R.T. in the Total_LBAs_Written field. 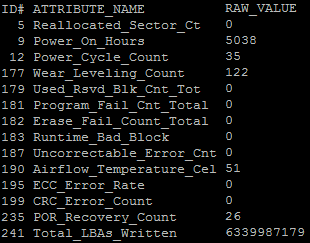 Unfortunatelly, VMware makes it hard to readout RAW S.M.A.R.T values on ESXi hosts. For that reason I've ported a version of smartctl, which is part of smartmontools to ESXi. I've made the package available as VIB. The download link is at the bottom of this post. First of all, let's get started what you can see on an ESXi Host regarding to endurance without smartctl. In this example I'm using a Samsung SSD 850 EVO M.2 250GB which is currently in use as a local Datastore. Warranty for this device is 75TBW. Just mentioning that this is a consumer grade SSD. The lowest Endurance Class for Virtual SAN for exmaple starts at 365TBW. ESXi keeps track of all read and write operations to the disk. These counters are reset when ESXi is rebooted. So this does not help to determine wear leveling either. In the SMART Attributes section, we can find with the ID #241 our Total_LBAs_Written value. This value needs to be multiplied with the sector size which is 512 bytes and divided by 1099511627776 (1024^4) to get Terabytes. This also proves that the value in "esxcli storage core device stats get" is wrong, respectively only counted since the last reboot. Blocks written according to this command is 2123298938 which results in about 1TB. !!! Please note that the use of this VIB is absolutely unsupported. Use at your own risk !!! The tool is located at /opt/smartmontools/smartctl and works just like the Linux version. Warning: This result is based on an Attribute check. data collection:                (    0) seconds. capabilities:                    (0x53) SMART execute Offline immediate. recommended polling time:        (   2) minutes. recommended polling time:        ( 133) minutes. Warning! SMART Selective Self-Test Log Structure error: invalid SMART checksum. Can I Upgrade ESXi 6.0 Beta/RC to ESXi 6.0 GA? I can get my hands on a system with a NVMe device tomorrow. I will look into it. How's working with behind hardware raid controller? Just out of curiosity what did you use for a compile environment for the static smartctl? I'm currently using an aged CentOS 3.9 and was wondering if something newer was valid. I've experimented with a couple other options but always seem to go back to that one for one reason or another. I did not compile it by myself, I used the latest linux compatible nightly build from http://builds.smartmontools.org/ and made a vib package out of it. /opt/lsi/storcli/storcli -CfgDsply -a0 | grep "Device Id\|DISK"
I have this same problem, do you have solution? So on my regular no ESXI hosts I use smartctl to check drive health behind raid controllers like so. smartctl is not working properly for NVMe drives, can you please let us know any alternative command do we have to get smart details for NVMe drive in esxcli. First of all, congrats on the great work done on this, as well as your entire blog. I found it useful numerous times. I did some additional testing and got this proactively reported to Zabbix via simple triggers and zabbix trapper in the latest 3.4 release. If interested, drop me a line. capabilities: (0x7f) SMART execute Offline immediate. SCT capabilities: (0x0021) SCT Status supported. What do you think a 240GB SSD having 80TBW endurance rating will last with normal workload? My esxi is set to use efi/secure boot. Am I correct that if acceptance level is set to community, esxi host will not boot with secure mode enabled?